Hey y'all! It's hard to believe that this time last year I was stressing about recruitment, and now here I am preparing to go through recruitment on the "other side." Worrying about recommendations, outfits, and the hot weather that I knew was coming took up a lot of my time last year. I mean, it was second semester, and I was basically already done with senior year. 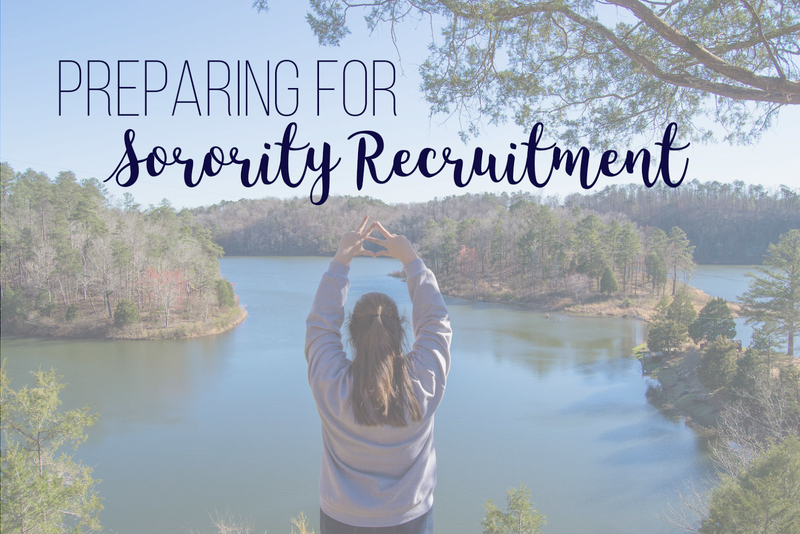 Today I am going to share how I got "recruitment ready." If you're new here/didn't know, I am about to be a sophomore at the University of Alabama, and I am a Kappa Alpha Theta. I didn't come from a family that was huge on Greek life. My mom was in a sorority, but she didn't love it and ended up dropping, and my sister went to a women's college. I knew that I wanted to be in a sorority, but I wasn't sure exactly what I was getting myself into. Being me, I researched and researched and researched. I spent hours upon hours reading about what to wear and what happens and what to talk about. I was obviously still nervous going into recruitment, but I defintely knew exactly what I was preparing for, which was really nice. One of the greatest helps I had with recs was my local Alumnae Panhellenic Association. There was a day where they held an information session, and girls came and talked about their experiences, but the alumnae also helped you with getting recs. Like I said, I am not a part of a huge Greek family, so I didn't have legacy connections. My friends and teachers did help me out, and I posted on Facebook asking for help, but recruitment at Alabama is huge. You can send up to two recs per sorority. That can mean needing at most 32 recommendations. 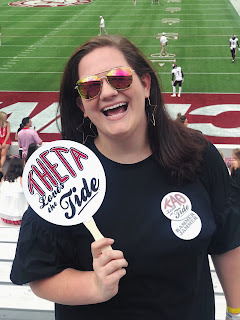 I would highly recommend checking out your local alumnae association to see if they can help, especially if you are going to a school where recruitment is a big deal like Alabama or other SEC schools. The alumnae association requested that we create recruitment packets which included an information form, a headshot, and a resume. I included all the same stuff plus a transcript for the people writing me recommendations outside of the alumnae association. This is a really great article about what to included in a rec packet. Alabama suggested to include the resume, transcript, picture, and a thank you note! For people who I could directly give the packets to, I printed everything out and put it in a folder. For people who I had to contact over social media, I just emailed them everything. Here's the thing about recommendations: They can't hurt you. They only help you. A rec is like extra credit, so you don't have to get them, but they are highly recommended, so if you can get them, defintely get them. One of the first places I found a ton of information about sororities is Sorority Sugar. I would spend days scrolling through the pictures and reading about everything. Their Rush Wear guide was my first step to figuring out what to wear. Cross reference with your school's rush wear guide, and that will give you a good head start on finding outfits. Alabama's is really good, and so is UGA's. First I looked at what I already had in my closet, and then I spent the spring and summer picking up dresses that could work for the other days. By the summer before recruitment, I really only needed one more dress because most parties at Alabama are two days. There's no need to buy an entire new wardrobe/designer clothes. Find outfits that you are comfortable in because when you feel awkward in what you wear, people can usually tell! You want to be focusing on the conversation, not whether or not your dress is about to fall down or if your dress is digging into your skin. Keep in mind that the days get fancier as you go on with Preference Night being the nicest. Also double check if your school requires a certain color dress for Preference and/or Bid Day because I know UGA and Kentucky both do. Again, you can see what I wore here. This is probably what I was most nervous about. I am not the best at meeting new people. Sometimes my nervousness results in me talking, which works for recruitment, but sometimes I will legit shut down and not talk. Once I learned how structured recruitment was, I felt a lot better. Sorority Sugar also has great tips about questions to answer and questions to ask. Go through the questions and practice general answers, so you have a feel of what to expect. A lot of the first day is answering questions like What's your major? Where do you live? What did you do in high school? What did you do over the summer? Another thing that helped calm my nerves is that the girls who are "rushing" you are also nervous, so don't worry too much! Just be prepared to put your best foot forward. Here's my Pinterest board all about Recruitment! Definitely check out Sorority Sugar's ABC of Formal Sorority Recruitment. If you're going through recruitment, good luck! !